If you were a little (or a lottle ((it’s a new word I just invented))) disappointed by the live action Avatar movie, then this may soothe your aching head – it’s the first trailer for the new cartoon series from Nickelodeon, Avatar: The Legend of Korra. The original Avatar was accused of having steampunk elements, and this one goes a step further, with actual airships. 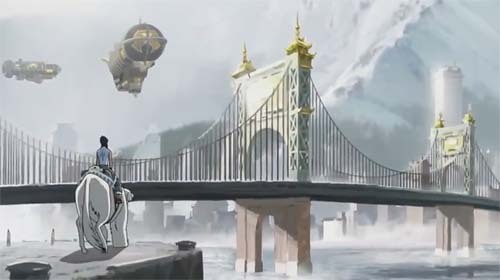 From what I’ve seen, some of the shots are showing large cities, cars, bad guys wearing fedora-like hats, so perhaps we’re evolving towards dieselpunk with Avatar The Legend of Korra?